The scalability and global availability of AWS enables us to serve the needs of Fortune 500 corporations. And the ease with which we can integrate thousands of software solutions on AWS using custom-built APIs helps us get clients up and running quickly with a flexible solution tailored to their needs. Business-critical applications such as Enterprise Resource Planning (ERP) software help drive productivity, growth, and success within an enterprise. But for employees using multiple software solutions daily for their jobs, learning how to use business software can be daunting and complex. Many companies spend tens of thousands of dollars and weeks training employees on how to use the software they need to succeed. There’s a conflict between software-driven productivity and the productivity employees lose as they learn how to use software efficiently. By putting the end user first, Clear Software aims to change the way users interact with business software. 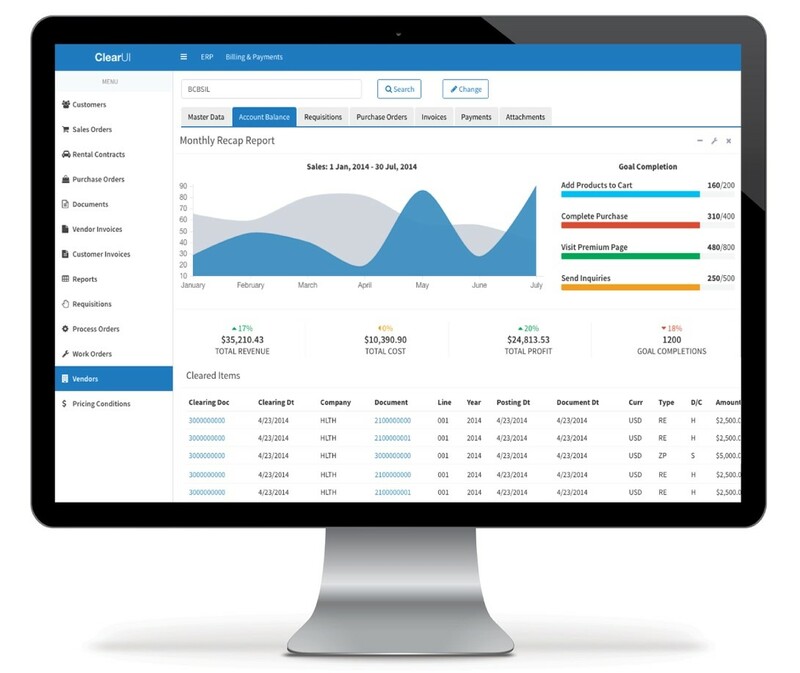 After developing a new user interface for enterprises running SAP and spending years on customer research, Clear Software was born. The company released its flagship product, ClearUI, with a user interface that streamlines tasks across enterprise applications by turning them into logical business processes. The company runs its platform-agnostic UI and integration hub on Amazon Web Services (AWS) as SaaS. It helps enterprises aggregate information from numerous systems and gives end users a graphically appealing, intuitive interface from which they can pull and visualize data unique to their department and needs. As Clear Software worked on new solutions and software integrations, the team decided to engage with an expert to learn how to take full advantage of AWS technology. Trek10, an Advanced AWS Consulting Partner, was an ideal match for Clear Software’s needs. It holds the AWS DevOps and AWS IoT Competencies and is an AWS Managed Service Provider. It also holds AWS Service Delivery designations in in Amazon API Gateway, Amazon DynamoDB, and AWS Lambda. “Trek10’s mission is to help our customers use the highest order of services on AWS to build scalable architectures by enabling or introducing the concept of serverless computing,” says Jim Abercrombie, president at Trek10. The company focuses exclusively on event-driven computing on AWS and provides robust AWS training for its employees. Trek10 initially engaged with Clear Software to evaluate the company’s requirements, challenges, and long-term goals, followed by a six-month proof-of-concept (POC) to help Clear Software optimize its use of AWS. “Clear Software was looking for a partner who strives to help clients use the best of what’s available on AWS, and that’s at the heart of what we do,” says Reyes. The VPN appliance is the central nervous system of everything Clear Software does for its customers. “Our platform needs to be able to communicate reliably with customers’ on-premises systems. We have a very unique set of needs and that’s a critical point where we can't afford any failure,” says Gilman. Clear Software runs its entire business on AWS. It uses Amazon Elastic Compute Cloud (Amazon EC2) for compute power. Elastic Load Balancers scale its user interface and integration hub over many Amazon Virtual Private Cloud (VPC) instances. Amazon Route 53 directs customer subdomains to the appropriate load balancers so that its entire customer base can run on a single database and code base. The company uses Amazon Simple Email Service (SES) to receive customer emails that trigger AWS Lambda functions to automate business processes in a customer’s enterprise software systems. Amazon Simple Queue Service (Amazon SQS), Amazon CloudWatch, and AWS Lambda allow customers to load large datasets into the same systems. Amazon Relational Database Service (Amazon RDS) drives customer configuration settings for both the user interface and the integration hub. Today, the Clear Software team depends on Trek10 to manage its AWS resources. For the Trek10 team, the work with Clear Software has just begun. “We’re looking forward to helping the Clear Software team take advantage of CI/CD pipelines to deploy software faster and begin to explore container-based and immutable architecture design,” says Magee. Going all in with AWS has helped Clear Software respond to and anticipate customer needs and demands and develop a nimble solution integrating thousands of software systems, giving end users a central place to come to do their jobs. As for Clear, the company plans to launch a new serverless ERP solution for enterprise customers to transform the way people use enterprise software. Born in the cloud and 100 percent focused on AWS, Trek10 specializes in leveraging the best tools and AWS managed services to design, build, and support cutting-edge solutions for its clients. The company is an Advanced AWS Consulting Partner and holds a number of AWS distinctions including the AWS DevOps and IoT Competencies and the Amazon API Gateway, Amazon DynamoDB, and AWS Lambda Service Delivery badges. The company is also an AWS Managed Service Provider and AWS Public Sector Partner in Government and Education. For more information, contact Trek10 through its listing on the APN Partner Solution Finder or on their website.